Review: Imagine yourself as an orphan with no real home. Traveling from orphanage to orphanage, each one worse than the last. That is how Kate, Michael and Emma feel every single day in the Emerald Atlas by John Stephens. Kate and her two younger siblings, Michael and Emma, think that they have hit rock bottom. They are wrong. They are moved to another orphanage, which they believe to be worse than a nightmare. Upon their arrival, they find a secret laboratory. In the laboratory they find a leather bound book that is the color of an emerald gem. They put a picture in the book to keep it safe and suddenly they are lost in time. The adventure continues as they work to defeat an evil countess who's using the kids of Cambridge Falls as slaves. This book is full of never-ending suspense, fast-paced action, and loads of adventure. I love all of the figurative language the author used. Emerald Atlas is an amazing fantasy novel that teaches how nothing matters without family. The characters are very well developed. The book opens with a great prologue that sets the scene for the rest of the novel. The plot is full of action. Emerald Atlas is impossibly exiting. I could not put this book down no matter how hard I tried. The ending is so awesome; I cannot wait until the next book comes out. I rate this book a 5 out of 5. We would like to thank Random House for providing a copy of The Emerald Atlas for this review. 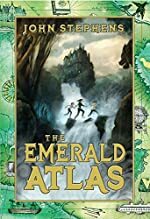 Have you read The Emerald Atlas? How would you rate it?